It's that time of the week...time to reveal what the contestants in the Fashion Challenge have created! This week they were asked to make a garment using a sweater knit print. They all received a piece of the same sweater knit. You may be thinking, ok they are just making any garment they want. Well yes, that's true. But for one, they may or may not have experience using it and two, they have to share with our readers some tips on working with sweater knits. Learn more about the details and requirements of the challenge HERE. At first glance, these ladies have set the bar high!!!! They all look amazing and were so creative in how they executed the project. You may find a more detailed blog post about each of their projects on their own blog. We had to modify the length of each blog post to better fit into this space. Click the link to their blog to see more. It was an absolute joy using this fabric. From the moment I saw the picture in my email I knew it would be a great fabric to work with. When I received the 3 yards of luscious knit, I was in awe, as it was even more beautiful and soft than I had imagined it would be. Immediately knew what I wanted to make with it when I saw it. 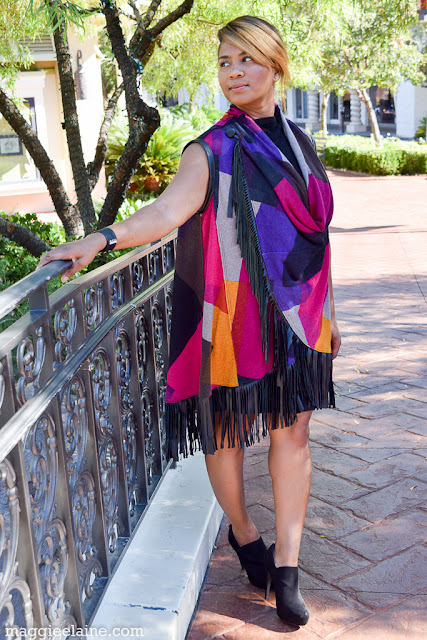 Being from Florida and I don’t get to wear and or make many fall garments, so I had a particular style in mind the minute I saw this fabric. I wanted something I could layer and dress up or down. 3 yards was just enough to see my vision come to full fruition. Though I made a pencil skirt to accompany my duster, it can be also be paired with a black pencil skirt or jeans to give it a total and complete different look. From dress upped to casual. I work with knit fabric often and love it. Ponte Roma is my knit of choice because it handles well and holds its form well. With this particular fabric, my serger was going to me my main tool, as I love neat and clean insides to be constructed as well as the outside. The facing was finished with a serged seam and I used my overlock for my hems. On this particular garment I used Burda 6587 for the bodice and pleated and draped and pleated the bottom of Duster cutting a rectangle in 3 sections three times the size of my waist measurement. For the pencil skirt, I draped on my body, pinned, cut and sewed, creating darts for fit, and added a self-waistband. I learned the self-waistband technique from Andrea of Sew-To-Fit. 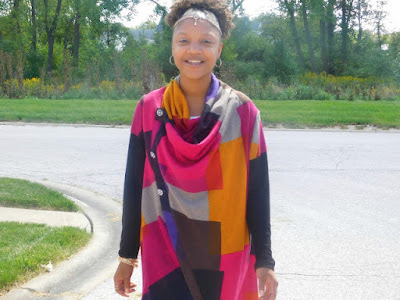 She has a quick and simple video and she is a wealth of knowledge for all things Knit at http://www.sewtofit.com/. 1. I baste my seams before final sewing to check for fitting issues and to adjust any gaps and alignment issues before final sewing. 2. I Under Stitch facings and serged neck areas where appropriate to make sure no seam rolling and that the fabric lay flat and neat (I didn’t have too with this particular garment). 3. Then I do all my final sewing of all seams, and serge each seam to finish. P.S. 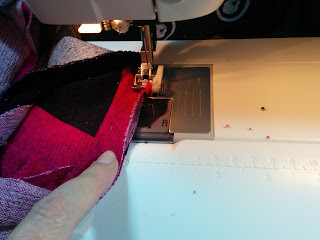 I have seen and heard on several blogs, that tissue paper under your fabric will help to keep your fabric aligned, I have a walking foot on my machine so I have not had to do this, but I thought it was a great tip. There are so many wonderful resources for sewing with knit fabrics and I tend to read up on them periodically. Beth with 110 Creations, has a great series on sewing with knits, that can be found HERE. Fall means lots of layering! 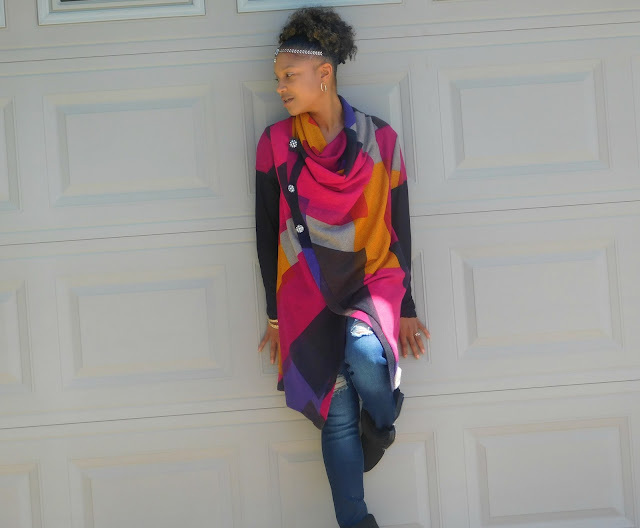 Cardigans, leggings, sweaters, boots I love it all. 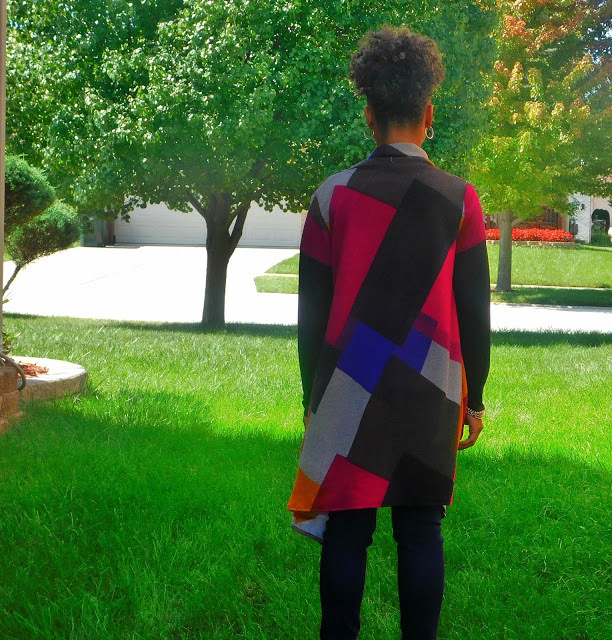 I knew I didn’t want to make a dress, or a cardigan, but cardi-dress came to mind, and I knew I wanted to try that. I googled cardigan dress and found this inspiration pic. McCalls 6886 is truly my TNT pattern! I used View E from that pattern, and added View B sleeves to it. Because the front of the dress is cut on fold, I cut those out on a single layer, one to line up the fabric, and two to have it open. For the neckband, and button placket, I measured the length of the dress from the center “V” down to the hem, adding the half of the neckband to it. That gave me 52”. So I cut 2- 52”x4” strips. After sewing that around the front of the dress, I started to have major doubts, that it was too simple. I talked to my mom, showed her my inspiration pic, and she said you have to add those pockets, it’ll be a great detail to it. I had NO clue how to make these so I just started by cutting 2- 2”x2” strips. I found the place where I wanted them to be, and marked it. From there, I folded in the the end, and with the raw edges facing up towards the mark, I basted it down to the front of the dress. Once it was basted, I flipped it up and sewed the ends down. While sewing with this beautiful sweater knit, I did 3 things that I think will help every beginner that is a bit nervous of giving this fabric a try. 1. Pre-treat your fabric. I learned the importance of this the hard way when I first started sewing. I searched online on different sites, and most of them suggested hand washing sweater knit fabric. I personally know that I am not a hand washing type of girl! I will forget overtime and having it in the washer!! So I decided to treat my fabric as I’m more likely to do once it’s made and that on a gentle/delicate cycle. I treated it and let it lay flat overnight to dry. Fabric turned out great, with no noticeable shrinkage. 2. 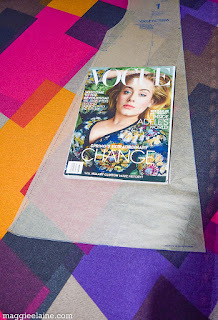 If you have a fabric that has a print like this one, cutting it out on single layer is KEY to lining up your print. I learned this from a Mimi G “Tipsy Tuesday Tip” where she talked about lining up stripes. Same steps apply here for lining up prints. 3. If you start sewing and your fabric starts to get chewed up, I used tissue paper (the tissue in gift bags) and put it under my fabric. This helps the fabric not to get stuck. You only need a small piece, and once you’re done, it tears off so easy!! I put a piece on top and bottom when sewing my buttonholes on. I used Vogue V9213 to make my look. 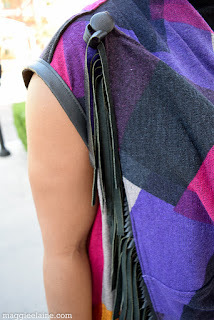 A sleeveless, draped sweater knit vest with leather fringe. 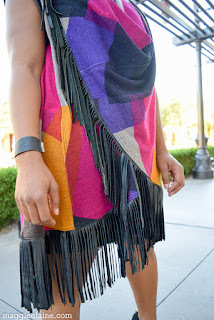 I made the fringe by recycling my grandmother’s old leather coat. 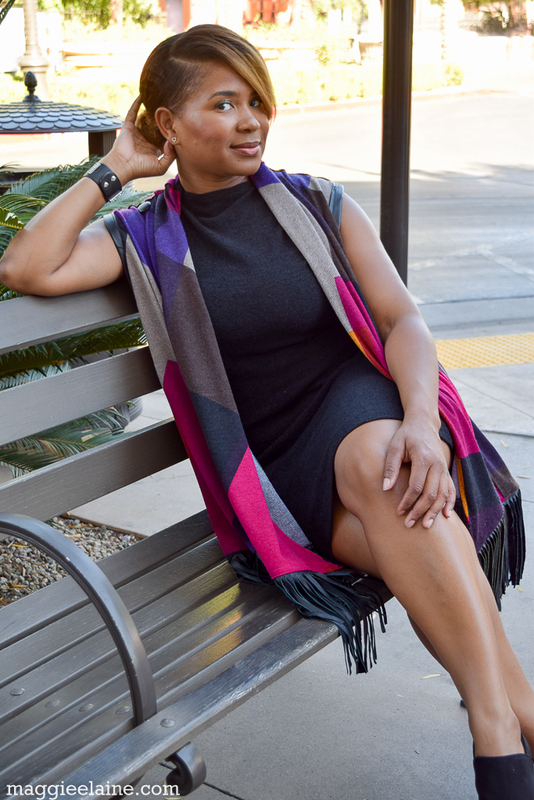 I also made the black sweater knit dress that I am wearing in the photos, to go along with the challenge this week and to coordinate with my look. 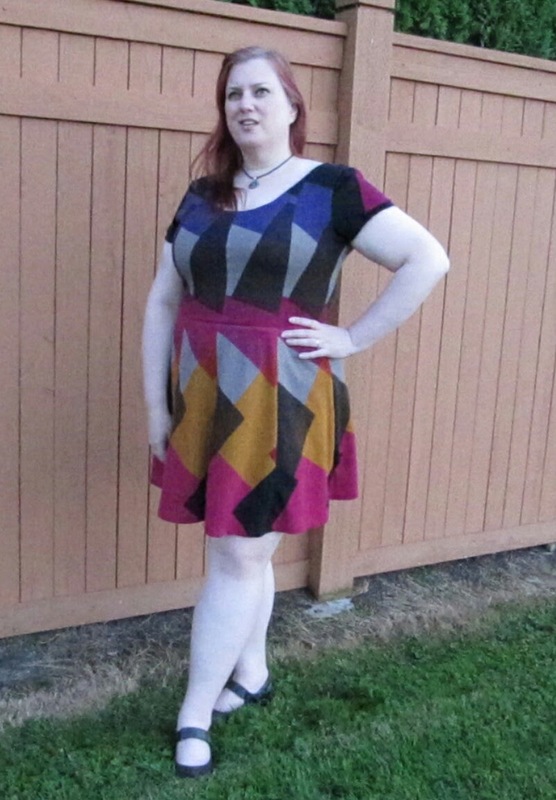 I self-drafted it from a RTW dress. Generally speaking, you should pre-treat most fabric, to allow it to shrink before you sew your garments. There is nothing worse than making something to fit perfectly, only to wash/dry clean it and it shrinks. I have had it happen. Nevertheless, I did not pre-treat this sweater knit. For sweaters/sweater knit dresses that I really, really, really like, I have them dry-cleaned to avoid the pill, fade, and lint factor. Well, I “triple” like this fabric and knew my garment would have enough volume that I could risk potential shrinkage at the dry cleaners. However, I have experimented with pre-treating sweater knit like this before. This is a poly/lycra blend with care instructions to gentle wash on cold, and tumble dry low or lay out flat to dry. 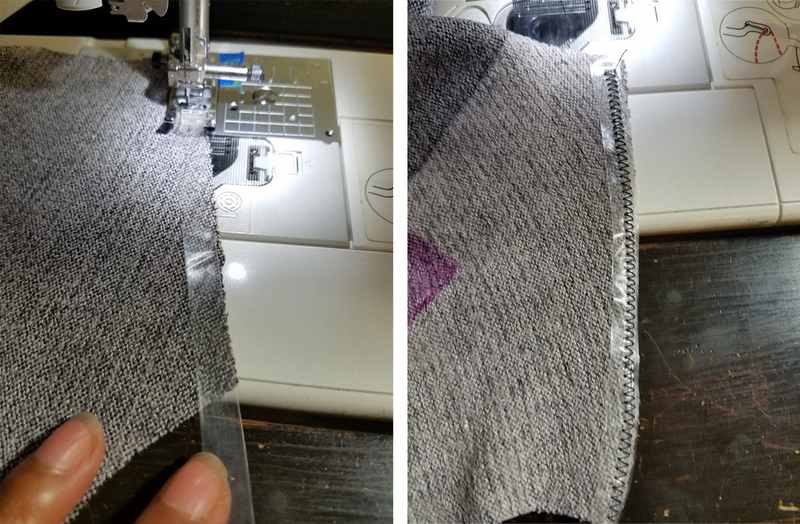 I followed the same instructions with my previous sweater knit, except I placed my fabric in a mesh laundry bag to reduce fraying on the cut edges. My best advice for pre-treating sweater knit is to FOLLOW THE CARE INSTRUCTIONS ON THE FABRIC BOLT. You don’t want to end up putting sweater knit, especially one with wool, in the washing machine when it is meant to be dry cleaned. A sharp rotary cutter is going to give you a more precise and clean cut, because it gives you more control over the cut when working with sweater knit. You are not lifting the fabric from your cutting surface as you would with fabric shears/scissors. Since the cut is so sharp, you also minimize the amount of fuzzy lint that you experience with cutting sweater knit with shears. It is a good idea to line a metal ruler up against your pattern and use that to help you guide your cut, especially along lengthy straight edges. I recommend using a metal carpenter’s L-ruler, because the side of the ruler is thick and the rotatory blade lines up well against it. Therefore, the blade has less of a tendency to veer off track when cutting. Plus you don’t get nicks or slices in your ruler, like you would with wood or plastic rulers. This is a tip I picked up from a bag-making class (my second-ever sewing class) that I took at Lillstreet Art Center in Chicago several years ago. You can find these rulers at the hardware store. Tip #4: Cut each fabric piece out one-by-one…wait what? I know what you are thinking… cut each piece out separately…Ain’t Nobody Got Time for That! Well, hear me out. 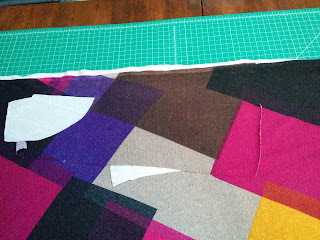 Although it takes a smidgen more time (ok a lot more time), to cut fabric pieces out one-by-one, I find that my pieces, are much more precise and EVEN vs. folding the fabric over and cutting two pieces at once. Sometimes, lightweight sweater knits, especially those that are loosely woven (think more sheer sweater knits), can be difficult to fold over just right and keep in place when cutting due to the nature of the knit. From my experience, the two pieces end up looking choppy and ill-matched. If you are like me, I don’t have the patience for pieces not lining up well when I go to stitch them. Plus you don’t want to affect the fit. Now, I did cut my back piece on the fold and that is, because I didn’t see the point in disturbing the print of the fabric to cut two pieces, only to sew them back together. If you are trying to match prints, you probably should cut your pieces out one-by-one with the right sides up anyway to make sure your prints match up. Therefore, spend the time on the front-end to make nice cuts. Tip #5: Slit Notches Oh No, Triangle Notches Oh Yea! 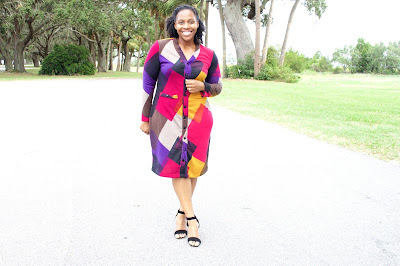 I decided to take the theme literally and used the fabric itself to create two different looks in this velvet trimmed cardigan and flat piping skirt. One of the cool things about sweater knits is that they often have a totally different look on the right side vs. the wrong side of the fabric. 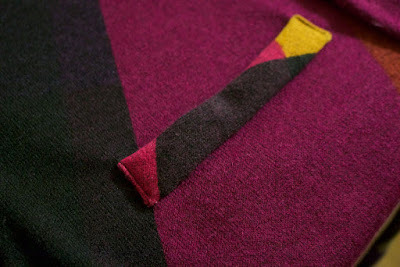 On this particular sweater knit, the effect was pretty striking. The bold, saturated colors on the right side of the fabric became softer, muted tones with a distinctly heathered texture on the reverse side. I was so taken by the wrong side of the fabric that I had to find a way to incorporate it. This particular sweater knit has a lot of good bounce and drape to it, courtesy of the lycra and polyester. I knew it would make a great skirt with a lot of swirl factor. I chose Ottobre 5-2014-10. It's a 6-gored skirt with cut-on godets that flare out considerably at the bottom to create a beautifully voluminous hem. You get the effect of a gathered skirt without all of the bulk at the waistband. For the gores, I used the reverse side of the fabric. In between each set of panels, I inserted some flat piping I made from 1" strips of the right side of the sweater knit. The strips were pressed in half lengthwise. Because this knit has so much body, it wasn't necessary to add cording to make the piping. The piping adds a nice bit of contrast and highlights the vertical lines of the seaming. 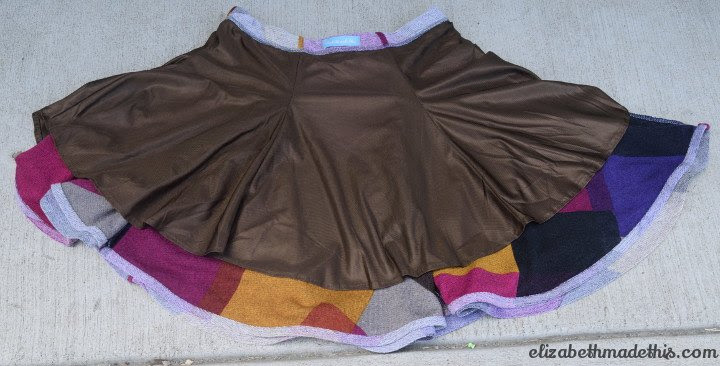 The skirt is lined with brown nylon tricot. The tricot makes the skirt hang nicely without the bother of wearing a fussy slip that's constantly shifting. The tricot also helps fight the fall/winter static that is so common in my dry cold climate. I really love the swish factor of this skirt. I don't think I've sewn a sweater knit that was so easy to work with or had such a nice weight to it. This is just the kind of skirt I love to wear with boots and tights in fall. For my second piece, I made a velvet trimmed cardigan using Ottobre 5-2012-6. This hooded cardigan pattern seemed another good choice to show both sides of the sweater knit. The hood uses the wrong side of the fabric facing out. I liked the softer shades of the wrong side around my face, and they looked nice against the brown ponte I used for the hood's lining. 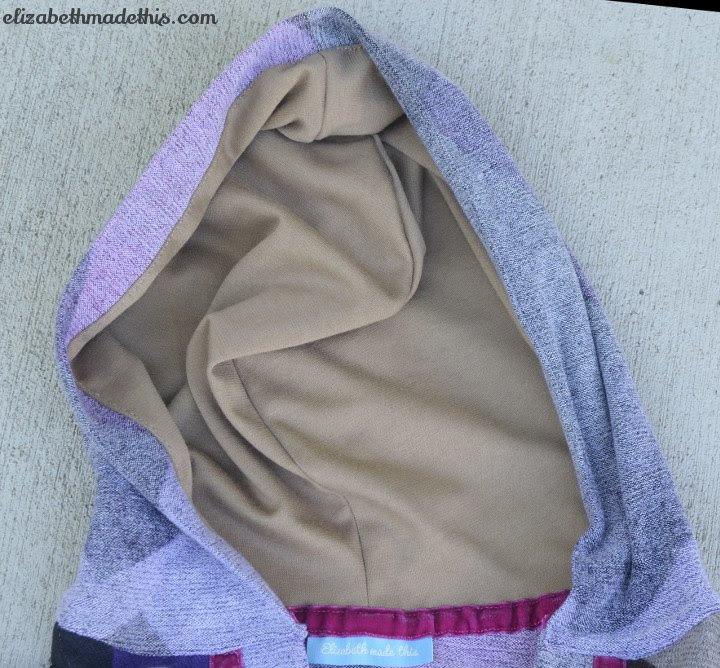 The pattern doesn't call for a lining, but hoods are simple enough to line. Cut the lining 1/4" from the hem line fold of the hood (7/8" shorter at the crown of the hood on this pattern). After I pressed the hood's hem, I sewed the hood lining to the raw edge of the hem from the wrong side. After pressing, I understitched the lining so that it would lay nicely without rolling towards the outside. Then the right side of the lining is flipped to cover the wrong side of the hood. The hood is cleanly finished and hangs better now than an unlined hood. The pattern called for the hood to be finished with a velvet ribbon at the neck. This not only covers the seam allowances, but it helps stabilize the sweater knit. Sweater knits sometimes stretch out of shape, so it's always a good idea to stabilize them. On a regular set-in sleeve type pattern, you can stabilize the knits by adding a strip of clear elastic to the shoulders. In a raglan sleeve, where the shoulder hits somewhere IN the sleeve, you need another solution to keep the knit from growing as you're sewing and wearing it. The velvet ribbon does the perfect job of keeping the knit from stretching. To highlight the contrast between the right and the wrong side of the fabric, I pressed up the hems towards the right side of the cardigan. I wanted to use more of the velvet ribbon as a decorative element on the cardigan. The raw edge of the hems is covered with the ribbon. The ribbon sits so that about 1/2 of the width sits covering the hem and the other 1/2 goes into the body of the cardigan. I used the same trim on the sleeves too. 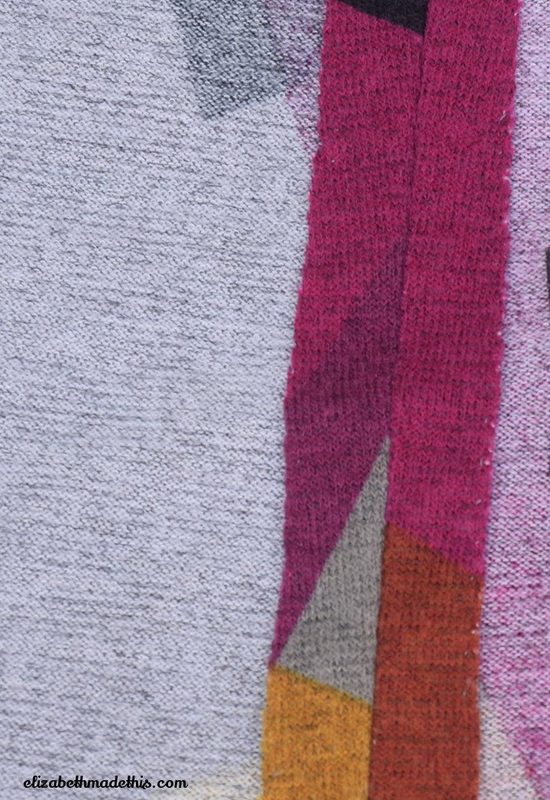 The front corners of the cardigan and the ribbon have mitered corners. If you're looking for a good tutorial on mitering corners, there's a good one here from the Colette Patterns blog. I love putting zippered welt pockets in my garments. They're very secure and add a great decorative element to any garment. I sewed regular zippered welt pockets from the right side using the help of Sandra Betzina's method from this video. Adding a little interfacing to the hems on a sweater knit adds some nice weight. It also helps you press a perfect hem, which might be hard to do on some more synthetic fibers. SewKeysE tape from Emma Seabrooke is my favorite for hems. Just press it to the wrong side of your hem. Next, press along the edge where the top of the tape hits the rest of the garment. Now your hem is ready for stitching. 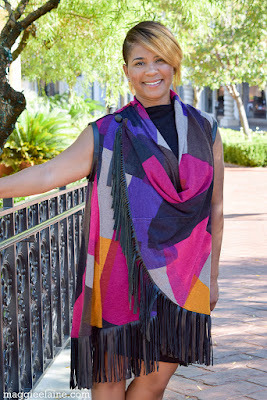 If you're working with a more sheer knit or one with an open weave, you can use a strip of your sweater knit as a layer of its own interfacing. 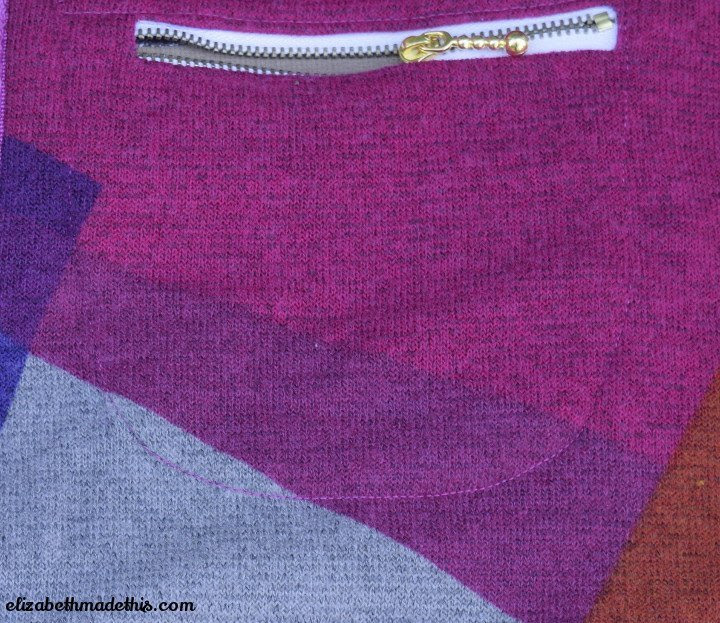 For sweater knits, sewing and finishing a seam at the same time with a serger, might not be the best option. Sweater knits are bulkier and often have more open weaves than regular jersey type knits, so they can stretch and grow in the serger, leaving you with a distorted seam. To combat this problem, first sew the seams with a stretch needle and then finish the seams. You can use your serger to finish the seam, do a double stitched seam, or you can press the seams open and stitch them flat with tiny hand stitches. I did this kind of finish on the inside of the cardigan because part of the seams shows on the hem. 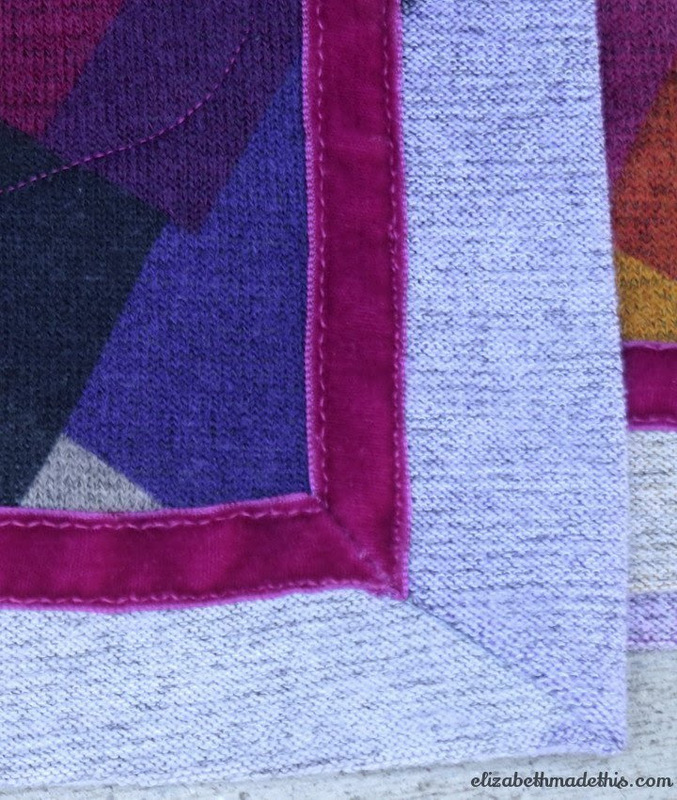 The open seams lay completely flat, and it's easy to bury your hand stitches in the loft of the knit. Whatever seam finish you choose, practice with some scraps of the knit to help you decide. Practicing can also help you determine if you have an unruly knit that might need some extra TLC. When you have the right needle, sewing sweater knits is easy. For most sweater knits, I like using a 75/11 stretch needle. Ballpoint or universal needles are some more options. My machine prefers the stretch needles for knits in general, but especially ones with lycra. If you're working with a more stable sweater knit, a universal needle works great. 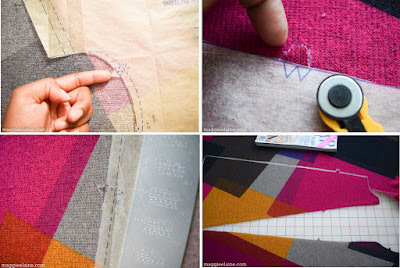 Practice on those scraps before you start sewing your garment to avoid headaches later in your project! When the fabric arrived, I was very pleased with the quality and the colors are just so pretty and perfect for fall. But because of the large scale of the pattern, I had a hard time wrapping my head around how best to use it. I also didn't like the idea of the mustard or the hot pink colors being close to my face. So, I sat and looked at the fabric laying out on my cutting table, sketchbook in hand and I remembered a technique I had seen not too long ago in a sewing magazine that I had been wanting to try. Unfortunately, I can't remember which magazine and even leafed through a few to see if I could find the article I was thinking about, with no luck. But the technique was to take a fabric with a large pattern repeat and cut out a particular portion of the repeat several times and sew them back together to make a new design. So, I decided to use my TNT Kitschy Coo Lady Skater pattern and divide each bodice and skirt piece vertically into 2 pieces, adding seam allowances between them, thus making 4 panels across the width of the dress. I used a previously altered Lady Skater front bodice piece and drew a vertical line from the bottom, halfway between the side seam stitching line and center front fold line (since seam allowances hadn't been added yet) up to where I thought it would look aesthetically pleasing and did the same for the bodice back. For the skirt I did the same, but I marked exactly halfway between the stitching lines at both the top and the bottom of the pattern. I then copied each of the pattern halves onto tissue paper and added seam allowances at the fold lines and to both halves where the original patterns were split in the middle. I started with the bodice and cut out one of the center front panels first. Then used it as a guide to determine where to lay the side bodice piece that was going to be next to it, matching the seam line on one side. 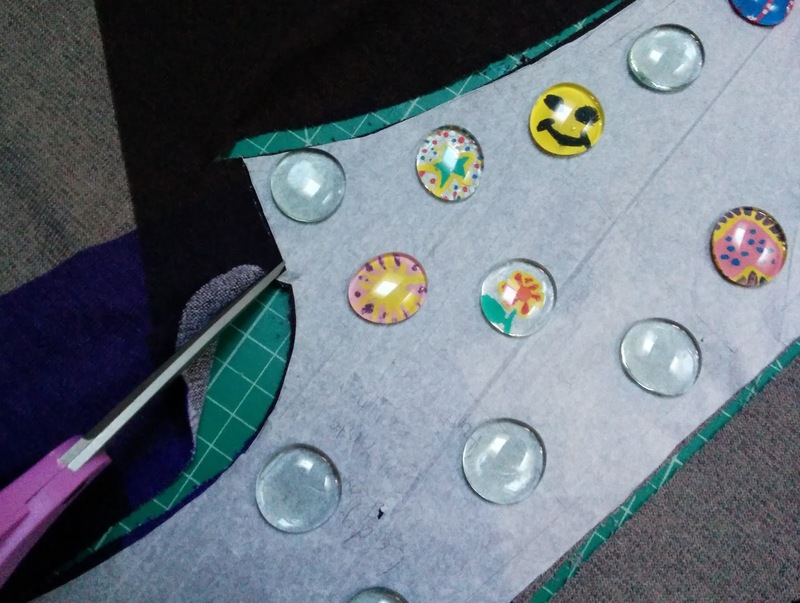 Since the top of the bodice pieces were very different shapes, I focused on making the fabric pattern at the waist seam consistent to get the effect I was after. My original sketch planned to use another sweater knit I have in my stash that is solid black for the sleeves, but after I pulled it out and looked at it, it didn't have the same sheen as the provided fabric and it just looked dull and lifeless next to this gorgeous knit. I considered leaving the dress sleeveless, but ultimately I want to have a dress that I will actually wear, so I decided to use the leftover fabric, which I barely had two pieces just big enough to cut the pattern's cap sleeves. I just positioned the sleeve piece such that the front of both sleeves had as much of the black as possible, to try to keep as close to my original vision as possible. I also had planned on using that other sweater knit for the neck band, but that was out now. I didn't want to just turn and stitch the neckline, so I made the decision to fully line the dress with a black cotton thermal knit with cameos printed on it that I picked a long time ago for very cheap and have thought I might never use. It had almost the exact stretch amount and was just a tad lighter than the sweater knit, so it seemed the perfect pairing. I used the unmodified pattern for the lining pieces and attached them to the shell at the neck, armscyes and the waist, letting the skirt lining basically hang free and just using french tacks to keep it in place. There are many different types of sweater knits. This one was what I’d consider a pretty stable sweater knit. The weave is tight and the fabric is opaque, but I’ve worked with very loose weave sweater knits before. I think Seamwork’s guide to sewing with sweater knits is a good starting point. 1. Keep a lint brush handy! Or what I refer to as a “rolly sticky.” When you cut into these fabrics, a million little loops get opened up, so there is lint EVERYWHERE. Not just on the cutting table, but they’ll be all over your machine and workspace and the garment and my dress form was covered in tiny pieces of sweater knit. 2. When cutting, mark your notches with pins or thread or do like I was taught growing up and cut them outward, not inward to avoid losing them in the weave of the sweater knit. 3. BASTE, BASTE, BASTE! 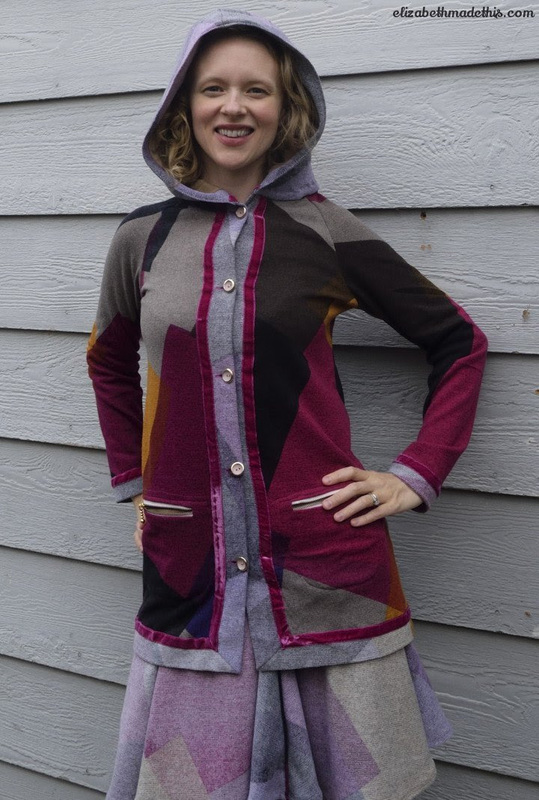 This is always a good idea anyway, but even with TNT patterns, it’s just smart to baste your seams first with sweater knits. Because sweater knits tend to be lofty, the stitches have this great way of just sinking in and disappearing, which is fantastic, but it also makes it so that the stitches are nearly impossible to see to rip out. Luckily I didn't have any mistakes this time around and I only know how hard the stitches are to rip out because after the dress was assembled, I thought maybe I would add a pocket. After about half an hour and only having about an inch ripped out, I decided it was way too much work and just resewed that bit shut again. But I definitely basted almost all of my seams first, especially that waist seam, since I wanted the vertical seams to match up perfectly. Below is a photo of how the seams just disappear. That is actually a seam right down the middle of the photo. I tend to be a fairly lazy sewist most of the time since I’m just making clothes for myself, but seeing how great this dress turned out actually made me take the extra time to hand sew an invisible hem. The fabric is nice and lofty, so I was able to catch a few threads of the body without anything even showing on the right side. Overall, this fabric was a dream to work with. It pressed really well, the seams absolutely disappear into it and it’s just gorgeous. I got to use a technique I’ve been wanting to use for a while and it made an amazing dress that I’m incredibly proud of and have been showing off to everyone who’ll pay attention to me. Fall is here. Time for football games, changing leaves and cooler weather. When I think of Fall, I think sweaters. A girl can never have too many! I wanted to make something big with this fabric. The pattern of this fabric is so big and bold and I did not want to lose any of that. I also wanted to do something cozy yet ultra feminine. I do not currently own any sweater coats, so I jumped on the opportunity to make one for my first challenge. 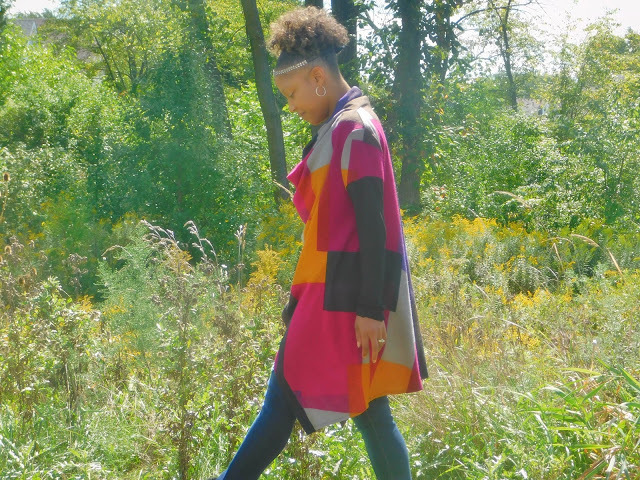 I used McCalls 7262 for this sweater coat. This was a challenge for me in other ways. I'm usually a monochromatic type of girl; solid colors only, etc... So this fabric was way out of my comfort zone. But it all worked out. Since this is a draped sweater coat, I was worried that the "fit" of the garment would not show. I am a petite girl and I usually have to make quite a few adjustments to all my patterns. However, not so much with this one. I took 2 inches out of each side seam because I was swimming in this coat. I also took 3 inches off the bottom to shorten the length. I wanted to keep the draped look of the coat without looking like it was too big on me, even though I cut the smallest size. Before I cut into this fabric, I needed to decide if I wanted the colors to match up at the seams. The fabric is so geometric and free that I felt that I should continue with the free flowing geometric 70's vibe. I think that by not color matching the seams, it really gives it the drapey, flowy look that I was going for. I also wanted to break up all the colors of the sweater, so I decided to contrast the sleeves with a plain black knit fabric. It has the appearance that I am wearing a black undershirt with a short sleeved sweater, when really, it is all one sleeve piece. I serged all my seams on the inside. Making sure that the inside is as neat as the outside is so important to me. Sewing with sweater knits is very similar to sewing with any other kind of knit fabric. However, there are a few tips that I recommend to make sewing a little easier. 1. Use clear elastic to stablize shoulder seams. Using clear elastic on areas that may stretch out over time, such as shoulder seams, necklines or even armholes, will prevent stretching. 2. You can press sweater knits. Use a good iron with a lot of steam, some pressing spray and a tailor's clapper. Don't have a tailor's clapper? I used a piece of wood that was broken off of my desk. It works just as good. 3. Prewash fabrics with proper detergent. I like to use Eucalan Fine Fabric Wash for all my sweater knits. It is a gentle cleanser. 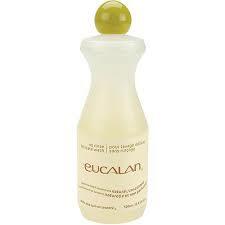 I not only prewash my sweater knits with Eucalan, I also hand wash my sweater knits with it too. I never, ever wash my sweater knits in the machine. Doing so, may stretch the fibers out of shape. 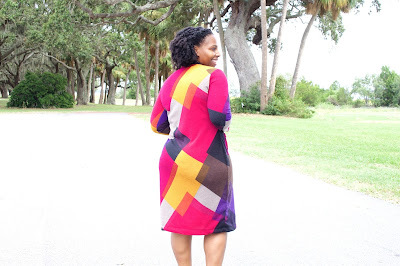 And....one last tip on sewing with sweater knits. Make sure you have a good manicure. Sweater knits tend to snag on poorly manicured finger nails. Trust me....it happened to me more than I like to admit! Vote for your favorite in this week's challenge now! Winner of this challenge will receive 3 patterns of their choice from our hand-picked pattern collection of Independent Pattern Designers. There's still time for our readers to participate! Post a photo of your finished sweater knit garment (and type of sweater knit can be used and in any way you like.) Use #FabricistaFabricMart when posting a photo on Facebook or Instagram. Post it by Sept 15 and you may win a 3 yard piece of the sweater knit the ladies used in the first challenge! I love Melanie's duster! That's exactly how I would've used this fabric. A simple design let's the fabric standout. When you get tired of wearing this, ship it right over! 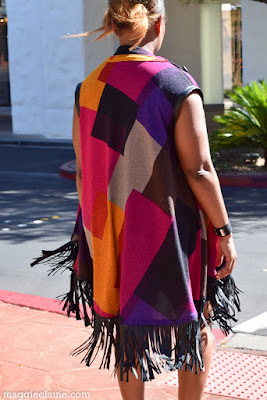 Tee, I love the fringe on your cardigan! Great Job! You all did such a fantastic job! That fabric screams fall. Love it. I love Melanie duster, I can take it off your hands. When you're done with it. I'm short and wide, so this fabric would have been a little overwhelming on me. 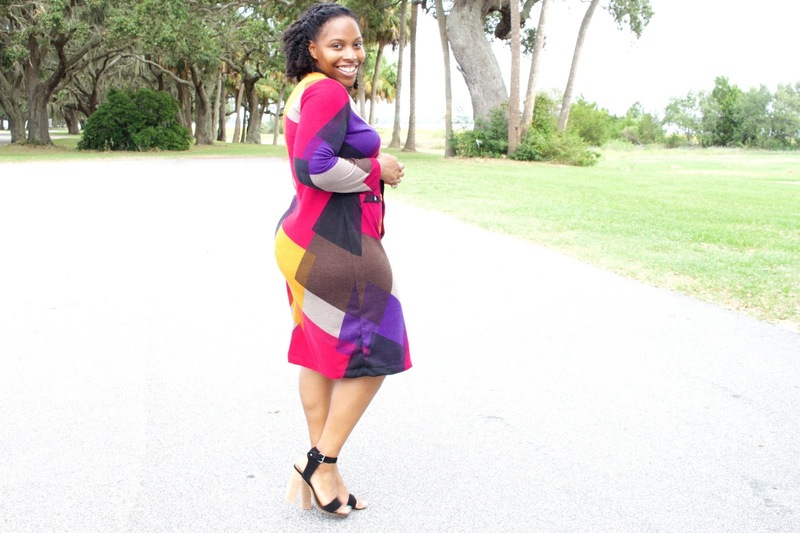 I love love love Jennifer from Clothing Hacker's solution. 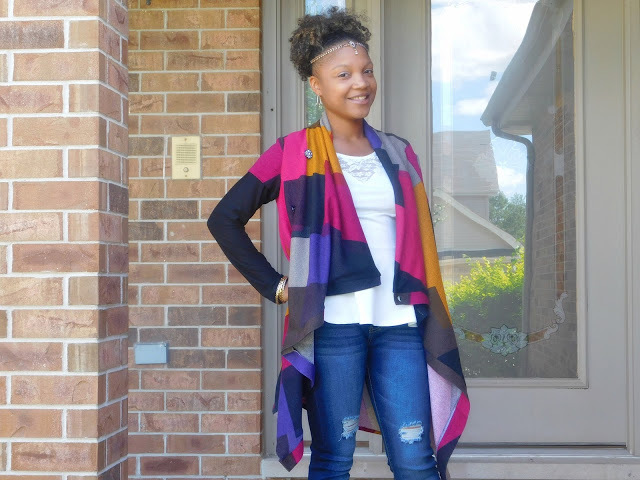 She tamed that print and made it work for her! I absolutely love Melanie's duster and the various ways she styled it. You all did a great job! Melanie I love your look, it's so versatile. Tee, the use of the fringe really blew me away. I love the fitted dress, Britt. Jennifer, your use of the fabric and is print was great. Everyone did a great job, though. I liked the hood on Elizabeth's piece. LaTonya, yours look like a staple piece for the fall. Great job to all. Melanie, that duster is tough! I absolutely love it! You ladies all did such a wonderful job! Each and every design is FABULOUS in this gorgeous fall colored sweater knit.Kudos to all contestants! Melanie's duster and pencil skirt combo was outstanding to me. The variety of ways she rocked it was brilliant. Melanie's duster and pencil skirt was outstanding to me. I love the variety of ways she rocked them. It was brilliant. You all did a great job!! Ver creative uses for this fabric! Now this is a competition! Everyone brought their A game so it's going to be fun to watch over the next couple of weeks! Wow! You ladies did great! I'm really impressed with your garments and tips. Awesome first round! I LOVE what Jennifer did with the fabric, that is awesome! Wow, I agree with Carolyn, this is a competition! Well done! I can't wait to see what everyone makes next week! WOW, they all were "sew" nice!! I have to say my choice would be Ms. Melanie Darling that's definitely something I want in my closet!! I love the duster Melanie made. Great job to everyone, beautiful fabric and beautiful garments. It is very hard to pick one. Deciding was hard. I think everyone did an outstanding job. WOW!!!! Some awesome work here!!!! Love what you have done! Love love love this fabric! I just recently got brave enough to sew with sweater knits and I LOVE the outcome! I really LOVE what Jennifer did with her sweater knit.....I have the same problem with mustard fabric against my face so I'll have to remember that advice in the future. To be honest that fabric is very busy, and not one that I would choose, but wow, these ladies made it happen! I really like Melanie's duster. Great job by everyone. I really like Melanie's duster as I love that pattern and have made it quite a bit but never in a print, until now! Look forward to seeing more from all of these ladies. All the entries are superb, but I'm particularly taken with Jennifer's dress! Such an inspired approach to a large scale print --- you're a genius Jennifer! Great job everyone! I know this can be a nerve wracking process and you all worked very hard to produce great pieces- so high fives and pats on the back all around! Good luck to each of you! This was a great first challenge and I think everyone did such a great job with their interpretation of the fabric. I was very happy to see no repeats. I voted, but I did not want to have to. Boy oh boy, what a first challenge. I suggest that they all go on as winners. Jennifer, the article you mentioned is from THREADS magazine. I was reading some of my back issues and read this article about four months ago. I cannot find that issue right now, I have nearly all of the issues, but that is where it came from. Great Job to all the ladies!